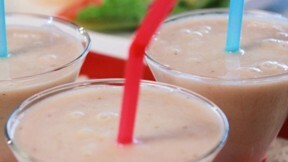 Vegans don't have to miss out on traditional Summer meals with Laura Theodore's all-American Summer recipes for vegans like this vegan banana milkshake recipe. Put all ingredients in a blender and process until smooth and creamy. Taste and add more nondairy milk or maple syrup, if desired. Pour the mixture into pretty glasses and serve at once.